On this page you will find a list of bars in Brussels, tried and tested by the American Club of Brussels! The location is near the Grand Place, the Bourse, and Le Théâtre Royal de Toone. Its entry way is deceiving as you enter a doorway with detailed architecture into an alleyway that would confuse its patrons. However, as you enter the bar, you are enchanted with a bar of years gone by. L'Archiduc opened in 1937 and has a vivid history. It opened as "a classy and discreet art deco establishment used by brokers and their secretaries" but with new owners in 1953 managed to become one of Brussels’ main jazz clubs. The bar has a varied selection of beers and spirits. 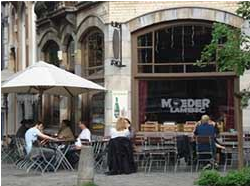 One of the first beer bars in Brussels, L'Atelier offers a great selection of over 100 beers. Beers are listed on a big board in categories to make it easier to find a beer you like! Moeder Lambic Fontainas The Moeder Lambic located at the Place Fontainas in central Brussels has “hundreds” of beers including non-Belgian ones. “Enter Poechenellekelder is to embrace the ancient history of Brussels ... To push the door of a real tavern, meet Manneken Pis, sit at the table of the heirs of the centenarian guilds and hear the murmurs of the Brussels citizens plotting against Philippe II, King of Spain ...” (from the website). The Black Sheep The Black Sheep, located just outside Place Flagey in Brussels, boasts an impressive selection of Belgian and international craft beers. 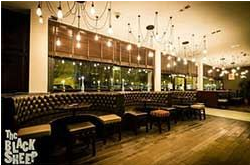 The gastro-pub also offers a menu full of delicious dishes including their famous fish and chips.